So Brooklyn Nine-Nine has never quite reached the same comedic heights as shows like The Office or Parks and Recreation in my head, but it is a fun little sitcom that delivers a lot of great moments more often than not. Earlier seasons were a bit crazier than you'd expect for something that takes place in a police department. But as the show has progressed over the years, a bit more sensibility has come in to push actual police work and related cases and investigations. 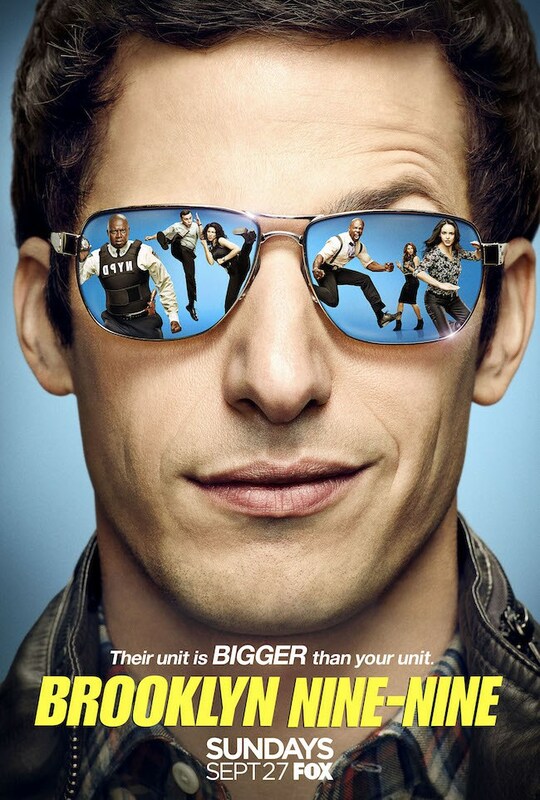 The third season of Brooklyn Nine-Nine actually had a pretty impressive larger story arc that transcended the typically episodic structure of the show that I rather enjoyed. And there were quite a number of developments in this season that represented significant shake-ups to the status quo. And the way things culminated in the end made for quite the fulfilling entertainment run on the whole. For me, this third season was one of the best for the show and one that I look back on fondly. As much as more recent seasons have continued to attempt to push the envelope, this season just had a great balance to it that hit so many buttons. Synopsis: Brooklyn Nine-Nine is an American police comedy TV show created by Dan Goor and Michael Schur. As of the time of this blog post the show is already airing its fifth season. With the "promotion" of Captain Holt (Andre Braugher) to the police PR department, the 99th precinct is now in need of a new Captain to run things. Thus we are introduced first to Captain Seth Dozerman (Bill Hader), who is all about maximum efficiency in all things and going by procedure. And naturally this gets in the way with the somewhat more relaxed environment of the precinct. As for the Captain and Gina (Chelsea Peretti), who accompanied him on his transfer, life isn't going much better with the constant taunting of Chief Wuntch (Kyra Sedgwick). On a more personal front you have Jake Peralta (Andy Samberg) and Amy Santiago (Melissa Fumero) dealing with their admission of having feelings for one another at the end of the last season. Charles Boyle (Joe Lo Truglio) is developing a bit of a thing for art gallery owner Genevieve (Mary Lynn Rajskub) but of course is uncertain as how to fully deal with things. And there's Rosa Riaz (Stepanie Beatriz) and her own relationship troubles with Marcus (Nick Cannon, who is also Captain Holt's nephew). What I Liked: As much as having a new "boss" running the nine-nine feels too much like when they had to find a replacement for Michael Scott on The Office, the scenario still worked out quite well and resulted in some great situations with unusual bosses. Plus finding a reason to drag in another talented SNL actor like Bill Hader always makes for some crazy television with shows like this. The mini-arc towards the finale involving a mob informant disrupting efforts to take down their operations turned out to be a great bit of police work and some of the best episodes of the show. They found a way to weave in a decent police procedural narrative with the crew's unusual zaniness and other behavioral quirks into some damn good television. This is how good comedies should go and it's a shame that this sort of thing can't happen all the time as it requires a fair amount of build-up. But the payoff is just so good. What Could Have Been Better: There are still a lot of weird episodic moments that weren't too great and had me wondering what the writers were smoking that week. "The 9-8" wasn't too terrible on the surface of things but the added dynamic of a whole other precinct didn't quite play out as one of the season's best episodes, even with Damon Wayans Jr. as a guest star. And then other parts of me wanted to play out more not having Captain Holt at the precinct. I know, we can't go away from the comfortable status quo of the show for too long without risking the stability of the show and all that. But I guess I was just genuinely excited that they were taking these characters in such a new direction plus Kyra Sedgwick as Wunth is a lot more fun than expected, so you can't really blame me for wanting more. TL;DR: Brooklyn Nine-Nine continues to deliver a solid comedy experience and this third season represents really playing with these characters given all their growth and development thus far. It starts very strong and the season also ends amazingly well with the episodes in-between carrying these characters well. Thus the season gets a full 5 revelations about their mystery mob informant out of a possible 5.